Now, as you can imagine, I am a huge fan of Meghan Markle. I loved her in Suits (and yes, I watched it before she was on the Royal radar.) And I’ve loved watching her from afar and seeing her pursuit of equality for women, as a UN women’s advocate, something which I feel comes from a genuine, authentic, heartfelt place and not just I’m-doing-this-because-it-will-help-my-career place. So like with every other normal well-wishing, people-loving member of the human race and obsessive wedding aficionado, I’ve been doing more than my fair share of Royal wedding research, by which I mean loads and loads ie way too much reading about this loved up royal couple and their royal wedding. Little by little, we’re being drip-feed information about the big Royal knees up. Why they can’t just tell us it all at once, I’ll never know, as they clearly know the whole working order from top to bottom, inside out, to the minute and second. But we’ll wait patiently, don’t worry. We know they’re getting married on 19th May at St George’s chapel in Windsor Castle. We know that the ceremony is going to start at midday. We know that they’re bucking tradition and getting married on a Saturday. Gasp! We know that the Archbishop of Canterbury will marry the couple. And that Meghan’s going to be trashing tradition and doing a speech at the reception. Gasp! This is awesome, but can I just say, this is nothing new. Brides in their droves have been doing this for a while now, however I’m loving nonetheless that Meghan is shaking it up, around those old palace corridors. Yet, with all that we do know so far, I’m feeling like we’ve not really got much to gasp about. I know it’s not my ceremony and they are not one of my couples but I was really hoping, as in you might find me carrying out some atheist prayers before bedtime, that Meghan and Harry would use their ceremony to show their true selves and their true love. Although, knowing that they’re having a religious ceremony which is being carried out by the top religious almighty of England, it doesn’t look good for my wishes (or theirs I imagine). If you’ve been a long term reader of my blog, you’ll know that I am not a fan of tradition for tradition’s sake. If you love a wedding tradition, have it, do it. If you don’t, don’t. Traditions do not equate to wedding pre-requisites or necessities, you know. Just because a wedding element has been done a lot, for a long time, it doesn’t mean it has to be done lots, for even more time. I can’t help but have a sneaky feeling that if Prince Harry and Meghan were getting married in EXACTLY their own way, they would not be having the ceremony that they’re going to have. Would they really get married in St George’s Chapel in Windsor Castle? Would they even get married in the UK at all? Would they have a church ceremony at all, let alone have the Archbishop of Canterbury marry them? Of course they wouldn’t. They’d totally hire out the whole of Richard Branson’s Necker Island and have their shebang there. Harry would wear a linen suit and white shirt, maybe even with a Panama hat (yes, that vibe) and Meghan would wear a beautiful floaty dress or strappy jumpsuit and go barefoot, maybe with some cute foot bracelets. They’d hire a local marriage celebrant and would have a smallish do (as small as it gets when you know the whole world) and would simply surround themselves with all their loved ones and those dear to them, and not dignitaries and VIPs that they kind of have to have because Granny says so. I understand that being a royal comes with its compromises and sacrifices and that Megan is signing up for that. There is the public side and the deeply, intensely private side, where the marriage between the two can be a tricky one, where they often don’t see eye to eye. And having binge- watched The Crown, series one and two, twice (okay, three times) and believing everything that came on the screen, I can well believe that the Queen is a stickler for the royal traditions and upholds them unapologetically. But we have seen that with time and with a generation of younger, more badass royals that she has had to concede to some of these traditions and has had to let the world see the more human relatable side to them too. Just. 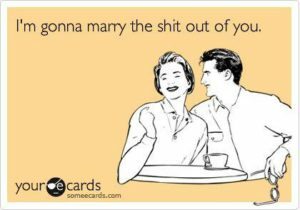 I could be wrong, this could REALLY be how Megan and Harry want to get married. But, nah, I’m not buying that for a second. 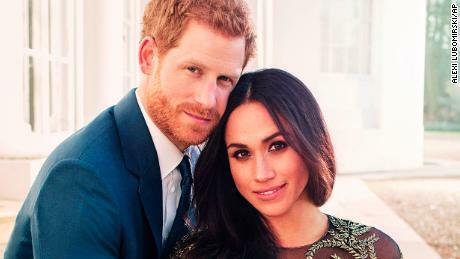 I think it’s going to be a long time before we see a number one or number two Royal truly marrying in the way they want to, if they had the choice. Yes, duty and tradition have loosened up a bit, and are less like the stuffy, pompous relative that we all know of too well, but that strong arm of theirs is still strong. Whilst Queen Elizabeth II is still alive and well and kicking and ruling, her offspring won’t be having their own way, any time soon, no matter how modern and badass they might be behind closed doors. So we’ll just have to wait. Or be surprised. Very surprised. Watch out for my other blog posts on these two royal love birds. Soon I’m going to share my fantasy ceremony – the one they’re definitely not going to have but which I’d love to be a guest at. What about you? What do you think about Meghan and Harry’s wedding? Do you think it’s a true reflection on them? Do you think duty and tradition should dictate their day?